Here’s part of our spinach bed (er, row) at the Derwood Demo Garden, a couple of weeks ago. We got a decent harvest from it, for spring-sown spinach, but with last week’s intense heat it bolted. I’ll try sowing spinach seed in August in soil cooled by watering and shade, and then try more in September when the temperatures are a bit cooler. If the plants get a good start they will winter over and grow vigorously next spring. 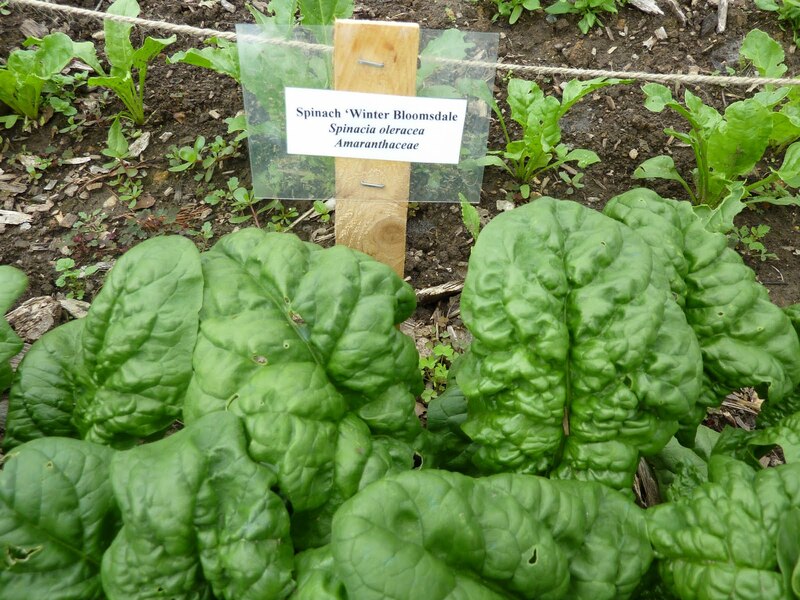 Last spring we harvested 7 pounds of spinach from a row about 6 feet long sown in the fall. If you want fresh-harvested spinach in the summer months, though, you’re pretty much out of luck, though you might be able to keep it going past June in a part-shade location. But don’t despair! Or even fret a little. You can have your spinach, and eat it too, if you’re willing to be flexible. Just how confusing common names of plants can be is too big a subject to treat in this post, but you can remember this: just because something is called spinach doesn’t mean it’s Spinacia oleracea or even related to it – but it probably means it tastes something like spinach. And it may be a “spinach alternative,” which usually means that it will grow in the kind of weather spinach hates, and substitute for it in recipes. So I decided to grow a whole bed of spinach and its similarly-named friends, to show demo garden visitors some alternatives. 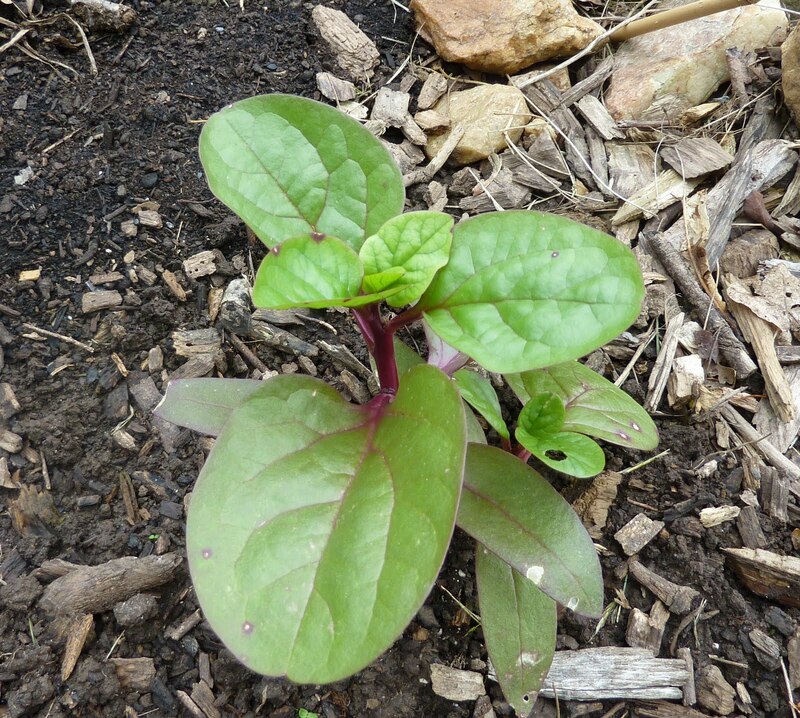 Of course we are growing our old friend Basella alba or Malabar spinach. This is a seedling of the rubra variety (sometimes you see Basella rubra) with red stems (the other kind has green stems). Malabar spinach (from the southern regions of Asia) is a climber; give it plenty of headroom as it can easily get six feet tall. It’s a glossy plant with attractive flowers and seeds late in the season, and the leaves are edible at any size, if somewhat mucilaginous. I’ve grown New Zealand spinach (Tetragonia tetragoniodes) before and really like it as a close alternative to regular spinach. It can be planted just after the last frost (though you should be able to get it started now too; soak the seeds first) and grows happily in the hottest temperatures we get, spreading out into a groundcover. Other plants we are trying include Egyptian Spinach or Molokheiya (Corchorus olitorius), Orach or Mountain Spinach (Atriplex hortensis), and Beetberry or Strawberry Spinach (Chenopodium capitatum), which has edible leaves and little fruits that are also edible if rather boring. If they do well I will post photos and tell you what they taste like. Call me the spinach lady if you want, but if you’re serving any of these don’t call me late for dinner! inach seeds. I tried to purchase the seeds locally but no one has any. Where can I purchase the seeds. Didn't get your whole comment so I'm not sure which seeds you want, but check out seed catalogs such as Bountiful Gardens, Johnny's, Pinetree and Baker Creek (all have online sites) and you should find what you're looking for.